Why do I have April Newman at the top of my page? Well, this happens to be the first photo I ever shot in my life. As a going away present for me, joining the Air Force and all, Dad and I thought the perfect gift would be a camera. 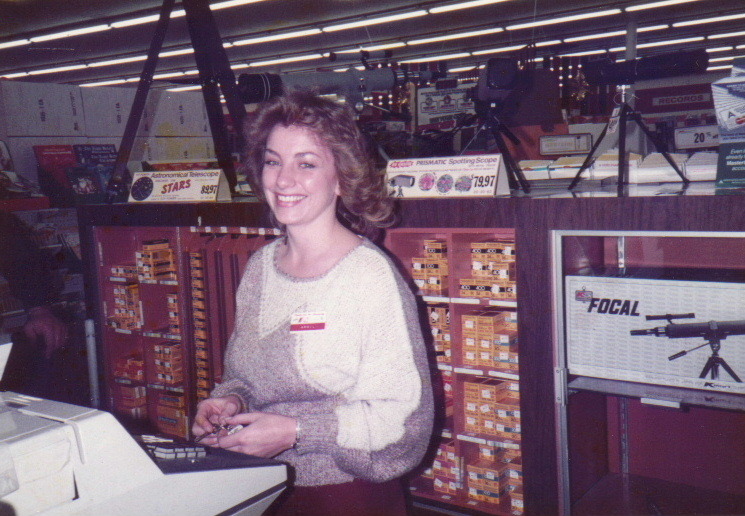 We went to K-Mart, bought the camera, bought the film, and this nice lady sold it to me. So I immortalized her. Dad was confused...he didn't know why I wanted her picture. He then took the camera and shot about ten photos of the inside of K-mart. I liked this photo best. 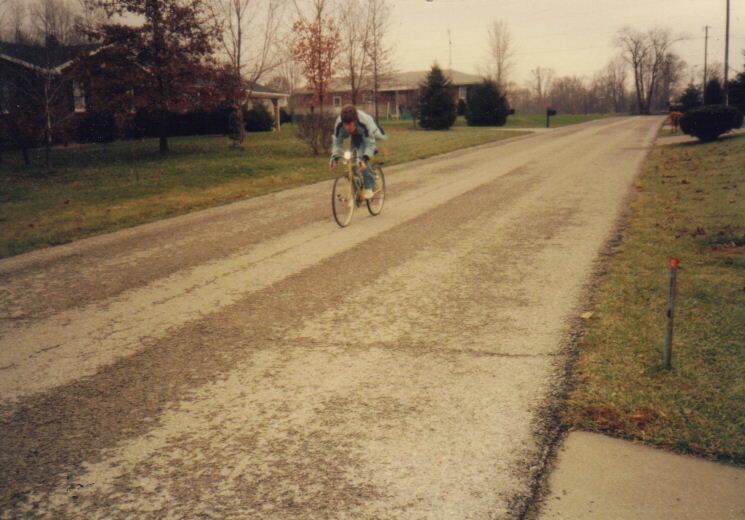 These are the only photos that exist of me riding a bicycle before 1987. This is my Schwinn Collegiate Sport, five-speeds, 40 pounds, not designed to ride very far...which is why it was falling apart. My parents purchased it for me on May 24, 1979 for $140, and since then I'd pushed the seat as high as it would go, the handlebars as low as they would go (I had upright handlebars on it until July 17, 1982), and did everything I could think of to make it faster (note aero waterbottle). 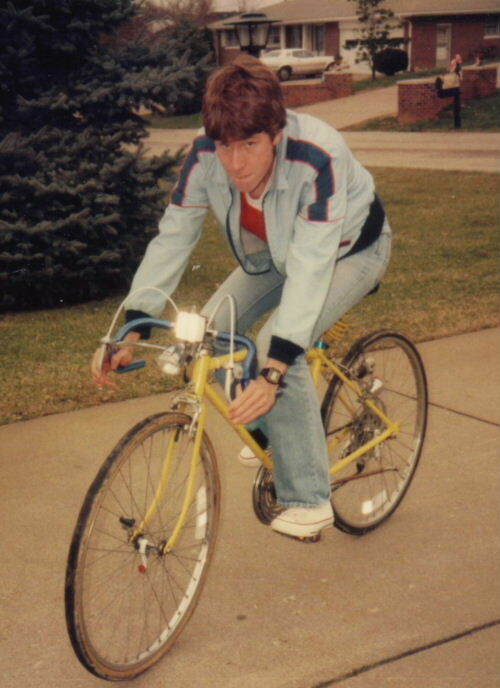 It was a nice bicycle if you like riding around the block but in 1980 I got the cycling bug and beat the crap out of this bicycle. My original plan was to get strong enough that I wouldn't get worn out riding five miles into town for errands. Once I reached that I found I wanted more. My insecurity and comments from my father made me think I had to be in great shape (and muscular) to be loved. I rode over 7000 miles in two years, all over town in this 'cycling gear' but never quite achieved physical beauty. 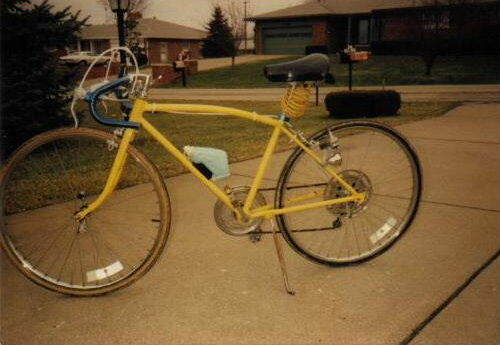 I looked the same and had ridden this bicycle into the ground. Besides that, I became so mobile I wasn't interested in driving a car, and didn't get a learner's permit until a few months before this photo was taking (by advice from my father). Still, it was a lot of fun. Once I was doing a ride ride to New Harmony, Indiana and 15 miles out, the rear hub went pop!!! I finished the 60 mile ride with a collapsed rear hub. I was pretty stubborn but it was time to put it out of my misery. I still have the jacket.